GB: First of all, how is development of Hellgate: London coming along? Have you recently reached any milestones or ran into any obstacles? Max: The development is going very well. We're in the thick of content creation these days, with more and more content being produced every day. It's a little bit frustrating because there has been so much work poured into it, but there's so far yet to go. On the other hand, seeing it all come together is envigorating! The female Templar model just went in recently, and lots of "looks" for the characters are working their way in. There's literally something new to see every build. GB: Tell us a bit about character creation in Hellgate: London and what steps a player will go through when initially customizing their character. Max: The player really customizes their character throughout the game. While you pick your basic look at the beginning, the real cool stuff comes in what you find when you're out adventuring. These are the flashy things, like magic helms, crazy new weapons, and those things that really make you stand out as an individual. Anyone can make a brown-haired, dark-skinned Female Templar, but not everyone can have a "Legendary Obsidian Battle Helm". You have to earn that! GB: Can you detail how character advancement will work as a player progresses through the game, including what happens when a character levels and whether or not you plan on setting a maximum number of levels a character can attain? Max: I cannot divulge the details of this yet. But your leveling will be fairly traditional, with stat points and the appropriate fanfare for reaching new levels. No level cap has been set yet; these things work their way out later in development. GB: Can you give us a few examples of the hellish foes we will be battling in the game? Will all of the game's adversaries be demonic in some nature? Or might we end up battling standard beasts or even humans? Max: The foes are a diverse lot, with demons, undead, beasts, and spectral monsters. There will be no humans (at least not live ones) to fight. This is pretty much a battle against demonic evil. GB: Do you plan on implementing a magic system in the game? If so, can you give us an idea of how magic will work and how characters will become more skilled with it? Any specific spells or effects you can tell us about? Max: There are arcane forces in our world, reflected in both skills and equipment. Our equipment is usually a blend of technology and arcane magic, much like spell-delivery systems. Additionally, players will learn skills that will call upon arcane forces. GB: How are you balancing ranged combat and melee combat so that one is not more powerful than the other? Also, can you give us a better understanding of how dual wielding is being implemented? Max: Ranged combat and melee combat will be balanced in a manner similar to conventional fantasy RPGs. Melee characters will be subject to more damage, and thus will have both natural toughness and resiliance and equipment that enhances that characteristic. Ranged players will emphasize movement, speed and accuracy. Balancing these two mechanics is a process that goes on throughout develpment. Because there are so many ways of dealing both melee and ranged damage, there are not set equations or theroies that cover everything. A lot of it is trial and error. We play our game constantly, and make adjustments on the fly, and will for the duration of development and beyond. Dual wielding is actually fairly simple. Anything that is one-handed can be duel-wielded. Players can set their mouse buttons to either fire/swing both weapons together, or use them individually. It's really fun in practice! GB: Will all item finds in Hellgate: London be random or are you including some static drops? Also, will all item statistics be randomly generated or might we see rare and unique "named" items ocassionally? Max: We generally don't like static drops. There are rules and limits for what can drop where, but in general we like random drops, so there's always the possibility of the next drop being the fantastic item. And there will certainly be categories of "rare", including named items. Those are fun! GB: Tell us a bit about how inventory management will work in the game, including how players will buy/sell equipment (if at all). Will encumbrance be a factor that players need to consider? If so, will there be frequent opportunities to sell excess equipment? Max: Players will have stats that limit their ability to equip items. This works as an effective level-limit. Buying and selling will go on in our safe zones, and involve NPC vendors, and players will be able to trade with one another. Additional trading and auction-type options are explored, as are items that cannot be traded. GB: How many different armor/weapon types are there in Hellgate: London and what sort of statistical bonuses and special effects can they possess? Will each item change a player's appearance when it's equipped? Max: Way too many to list. As we've said before, we intend to ship with over 100 base weapon types. The statistical bonuses and special effects will number much higher, and effectivly make for an infinite amount of possibilities. And they will change a player's appearance. That's half the fun of RPGs! GB: Can you explain how relic upgrades will work in Hellgate: London? Will there be multiple types of relics, such as weapon- or armor-specific ones? Can you provide a few examples of bonuses the relics will bestow? Max: There will be many types of relics, but not necessarily specific to armor or weapons. Their effects are more general, and less "tech"-y. For example, they might bump all types of damage, while a fuel mod might only bump fire damage. This is sort of a boring example, but the effects are more magical and universal than the tech mods. 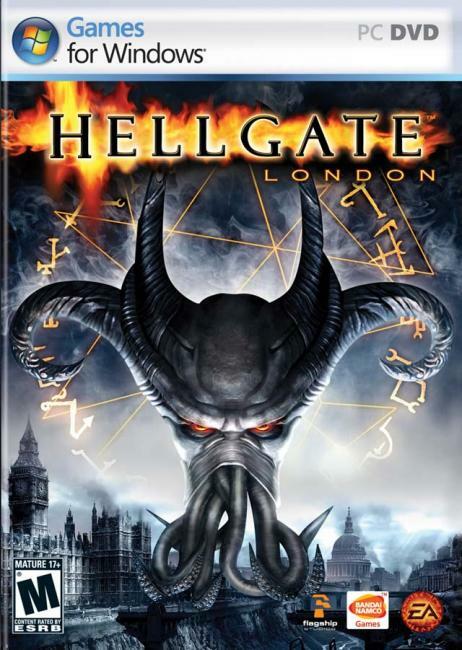 GB: How will the online portion of Hellgate: London work? Will we be able to play through the entire storyline cooperatively with friends? Or will the game only allow certain sections/maps to be played at a time? Also, how will the game scale in difficulty when more than one person is playing? Max: We're still developing the details of the online portion, but it will be based around cooperative play. Yes, you can play through the entire storyline with friends. Our adventuring areas are randomly generated each time out, so they can be more densly populated with larger parties, populated by tougher monsters, or even physically change in size. Look for lots of details about this to be released over the next several months. Thanks for answering our questions, Max!